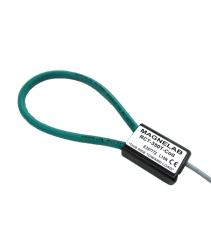 Magnelab’s RCS-350T is a 3 phase low error Rogowski coil set that transforms an AC input current up to 5000 Amps to a 0.333 Volt output. 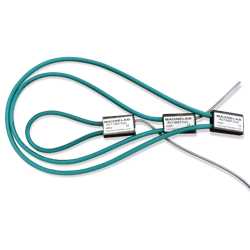 The RCS-350T is a 3 phase low error Rogowski coil set that comes with (3) 3.5″ RopeCTs (Rogowski Coils) and one integrator (signal conditioner) that converts the RopeCT voltage to 333 mVac output. The integrator requires a DC power supply that operates between 9 and 36 Vdc. The teardrop design of the RCS-350T allows for superior centering of the Rogowski coils (all Rogowski coils encounter small error if they are not perfectly centered). It is designed to allow a zip tie to be secured around the Rogowski coil, perfectly centering the primary conductor. The RCS-350T, like other Rogowski coils, allows for very wide ranges of input currents. The product is designed to operate from 10% to 130% of the rated current with 1% accuracy. For example, the RCS-350T-250, which is the 250A version, will be 1% accurate from 25A to 325A. The diameter opening of each Rogowski coil is 3.5 inches.